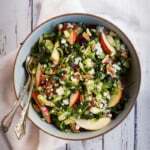 Are you a fan of brussels sprouts? 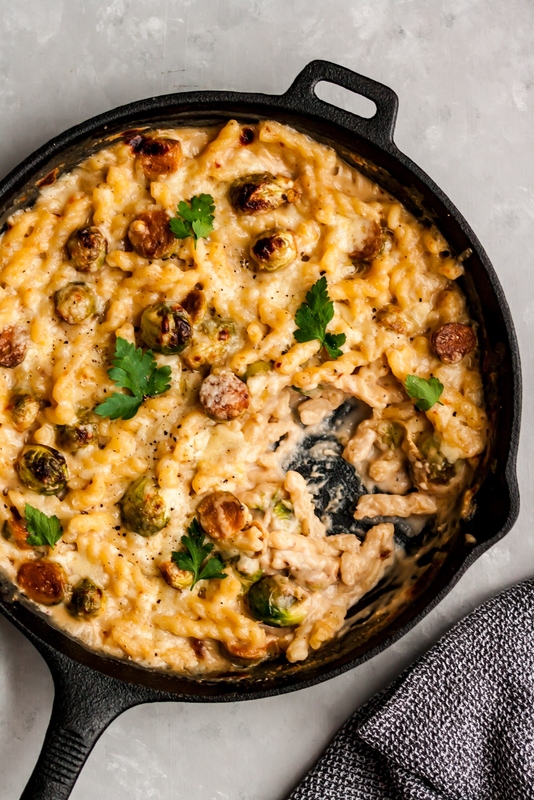 If not, I’m about to change your mind with this fabulous creamy, gooey brussels sprouts mac and cheese. Because let’s be honest, everything’s better when it involves mac and cheese. When I was growing up I ate a lot of Kraft Mac and Cheese. Specifically the spiral white cheddar mac and cheese with lots of black pepper and peas. It was kinda my jam. These days, I’m much more into cooking nutritious meals at home that Tony and I both enjoy. 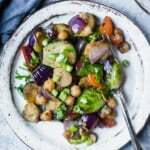 Tony’s not a huge brussels sprouts fan, but when I was crashing my cart around at the grocery store, I found beautiful brussels sprouts on sale and decided to throw them in and force him to try them out. The real question was how could I make sure he actually enjoyed them? I decided I would make a vegetarian one pan brussels sprouts mac and cheese with a lightened up creamy cheese sauce. 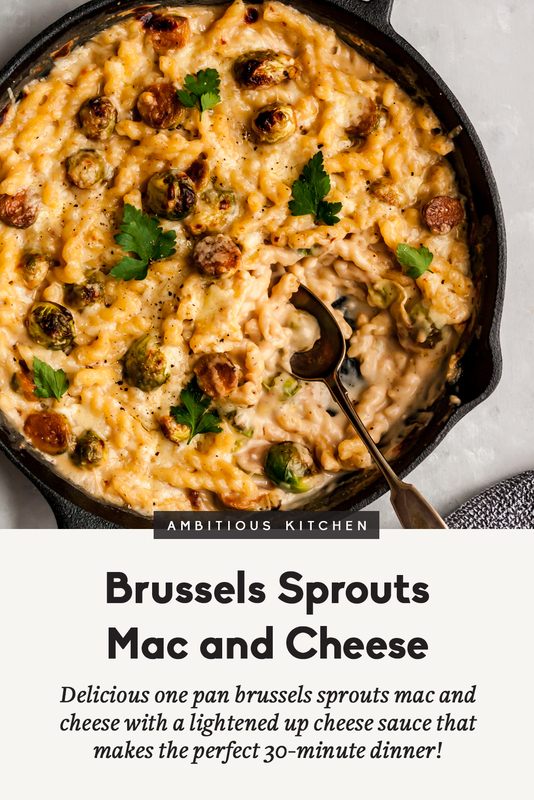 You’re probably wondering how this is lightened up mac and cheese and here’s the answer: less butter, less cheese, dairy free milk and LOTS of brussels instead of a ton of pasta. 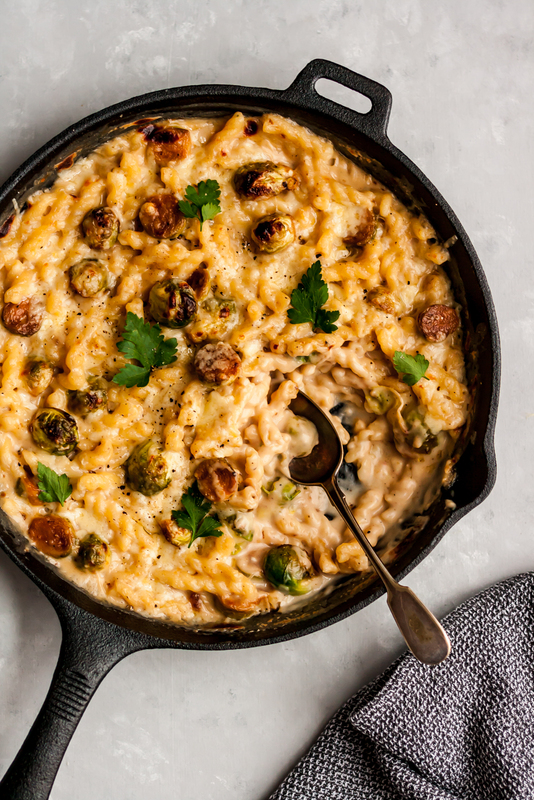 There are several ways to make this brussels sprouts mac and cheese go further too. Feel free to add in any of the following: 1-2 cups diced cooked chicken breast, 1/2 cup chopped bacon, 1 can tuna or 1 cup white beans. The possibilities are endless. 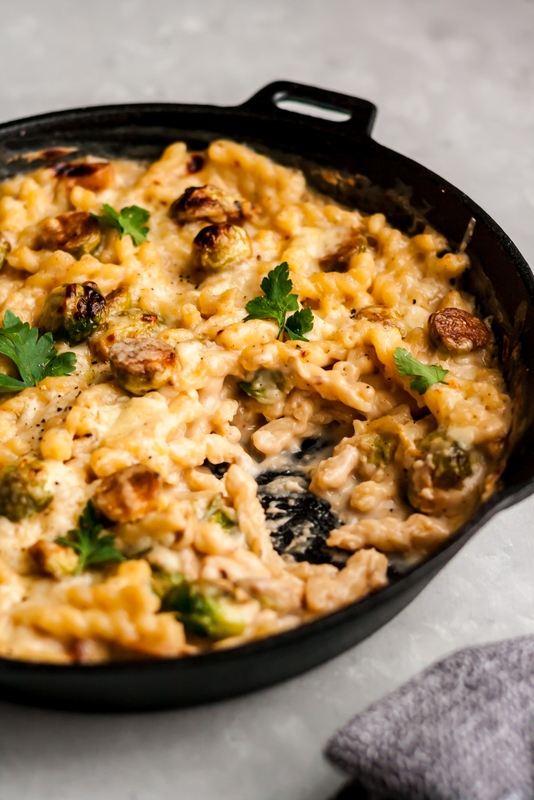 I know you’re going to love this cheesy easy brussels sprouts mac and cheese. The best part is that it’s made in one pan so you don’t have to get a bunch of dishes dirty. If you make this recipe, be sure to tag #ambitiouskitchen on Instagram. 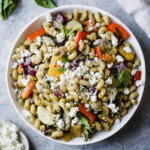 And don’t forget to rate the recipe and leave a comment below! Delicious brussels sprouts mac and cheese with a lightened up cheese sauce makes the perfect 30-minute dinner! 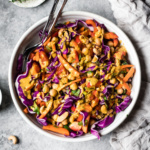 This easy recipe is perfect for kiddos and is a great way to eat extra veggies. First boil the noodles until al dente, according to the directions on the package. Once done cooking, drain and set aside. While the noodles are boiling, cook the brussels sprouts: In a large oven safe skillet or pot, add in olive oil. Once hot, add in brussels sprouts and sprinkle garlic powder on top, then season with salt and pepper. Stir frequently and cook until brussels begin to turn slightly golden brown, about 3-5 minutes. Once nice and golden, transfer to a large bowl and set aside. In the same skillet or pot, make a slurry: add butter and garlic. Once butter is melted, whisk in the flour and cook for 30 seconds until a paste forms. Slowly add in cashew/almondmilk (or regular milk), whisking away any lumps. Increase heat and bring mixture to a boil, then reduce heat and simmer for 5 minutes stirring every so often, until the sauce thickens up similar to a gravy. Next add in 6 ounce cheese and stir until cheese is completely melted. Finally, fold in cooked noodles and brussels sprouts. Taste and add additional salt and pepper, if it needs it. Top with additional 2 ounces shredded cheddar. 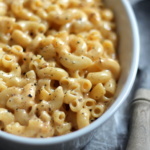 At this point you can either serve the mac and cheese and just fold in the extra cheddar you just added, or remove from heat and place under the oven broiler for 1-2 minutes or until cheese is bubbly and slightly golden. Serves 6. Top with a little freshly ground black pepper, and parsley if you’d like. To make gluten free: Feel free to use a gluten free pasta. My favorite is Banza. 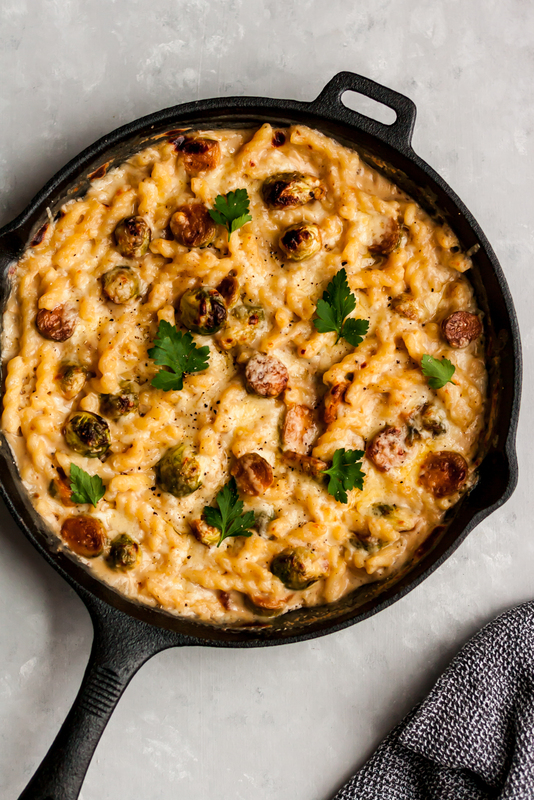 26 Responses to "Brussels Sprouts Mac and Cheese"
This one is a must too! So delicious. Lunch and dinner covered! Oh this looks delicious! 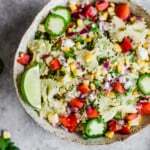 I really want to make this, I just need to make some time this weekend for this recipe, thank you! I saw this and immediately made it. I must say, it’s a terrific base recipe. I would like to find a way to really punch up the flavor (I used a medium cheddar but maybe a sharp or a blend would be great). I also sauteed smoked sausage and folded it in at the end. Love the texture and creaminess (used whole milk). Delicious! This one’s perfect for customizing. Glad you liked it! This was delicious! I also added cauliflower. Love this !!! Make it for dinner tonight . For leftovers, should they be reheated or is cold okay?? Would dairy free cheese work for this or you wouldn’t recommend? Hi Erica! It would work, but i don’t love the taste of dairy free cheese. 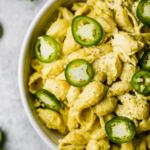 I would suggest using my cashew cheese sauce instead and folding it in: https://www.ambitiouskitchen.com/how-to-make-vegan-cashew-cheese-sauce/ so good! Made this tonight for the Super Bowl and it was excellent! Added a little bit of kale and cayenne pepper. Thanks! So happy to hear that! Love those additions. In your directions, it says to add garlic in with the butter, and then again with the cheese. I’m confused, insight would be appreciated! So far it looks delicious though! !